Microsoft will be launching the highly anticipated Windows 10 later this year, with a predicted launch during late summer or early autumn. Windows 10 will be available as a free upgrade to everybody who has Windows 7 or higher installed on their computers and there are rumours that even people running pirated versions of Windows will be offered the chance to upgrade for free. 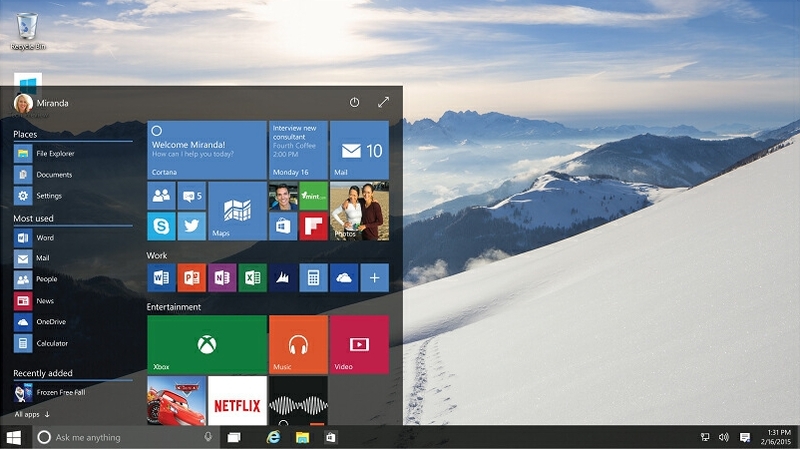 Windows 10 is promised to be a major game changer, so we shall look at some of the highlights so far. Windows 10 marks the end of life for Internet Explorer. Once the most popular Internet browser, Internet Explorer seen its market share decline, initially at the hands of Opera and Firefox, and more recently following the rise of Google’s Chrome browser. The replacement is Microsoft Edge, which will be the default browser in Windows 10. Microsoft Edge will provide new apps and features that allow note-taking and sharing over the Internet, among other features. Also included will be Cortana, a personal assistant that combines artificial intelligence with advanced information indexing and retrieval to provide automated updates and reminders to users. Cortana is already available on Windows Phones. Microsoft has decided to bring back the much loved Start Menu, while maintaining the Windows 8 tiles and also providing a fully customisable layout; there should be no reason to complain about the features of the desktop or navigation in Windows 10. Microsoft have created a new platform to encourage the development of apps. Windows 10 apps will be compatible across all Microsoft devices, so if an app is developed in Windows 10 it will work on PC, smartphones, smart TVs, tablets and HoloLens. App software development will become more affordable for businesses and this should help to lower the price for the end users. This change should see an increase in apps for the various Windows platforms and it has the potential to rival Android and Apple in the smartphone apps market. Windows 10 will also include the Universal Windows Platform Bridge toolkit, which allows developers to take Android and iOS apps and rebuild them for the Windows platform. This will provide businesses and app developers with an easier route to entering the Windows apps market. Continuum is a feature new to Windows 10 that allows tablets to quickly switch to PC mode, and vice versa. For example, Continuum will detect if a keyboard is connected to a tablet and immediately switch to PC format, removing the touchscreen keyboard from the tablet. Windows has never before provided a good photo editing app, but Windows 10 will feature a photo editing app allowing users to quickly crop and edit photos for easier sharing, as well as providing photo albums and sorting. The photo app will also provide the option to search for people within photos using facial recognition software, so you will never lose a photo of a friend or relative in your archives again. The new Windows Store will feature apps and downloads for Windows, using an interface that will be familiar to Google Play customers. Again, this will help promote Windows apps and provide a reason for users to upgrade their Android and iPhone smartphones to Windows. Microsoft first revealed some of its features in September 2014, showing how the new operating system worked equally well on PC, tablet and smartphone. It will also help drive Microsoft’s newest gaming console, the Xbox One, as well as Windows based smart TVs. Windows 10 may be the operating system the wins back trust and confidence in users who have migrated to Mac and Chrome in recent years. They are putting app development at the heart of their service to allow a seamless service across all device formats. This could be a winning move. Image credit: “Windows 10” by Source (WP:NFCC#4). Licensed under Fair use of copyrighted material in the context of Windows 10” href=”http://en.wikipedia.org/wiki/File:Windows_10.jpg”>Fair use via Wikipedia.